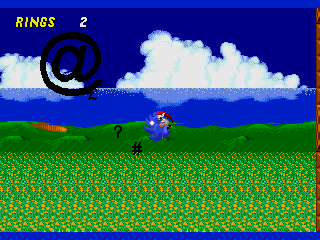 Lately I've been making quite a few hacks of Sonic games that are neat but don't quite deserve their own thread, so, after talking to a few people, we decided it may be a good idea to make a random sonic hack thread. If you have any projects that you've been working on that don't quite deserve their own thread, post them here! I've been wanting a thread like this for a while. However, I've not really got anything special to post at the moment, so I put together what I had lying about that retro hasn't seen yet. Next, the s2 versions of the s3k hacks I posted. 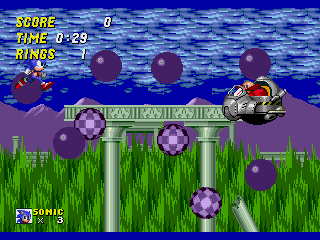 Yes, I made them in Sonic2 and ported them up. Click here for a version that has ports of the Motobug (EHZ) and the Walking Bomb (WFZ). I just had flashbacks to Contra on NES. I think I can do 400kB, but 256 is never going to happen. 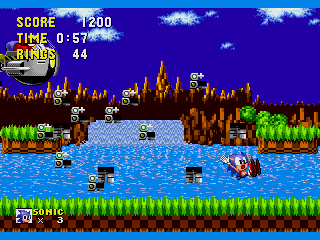 Out of curiosity, did you just rip the code out from the Sonic 1 mouse edition, or did you go about recreating it from your own resources? Just curious. I'm not sure I'm too fond of people hacking other people's hacks.. something about it just seems.. rude. :x I know we're basically just doing the same thing anyway, and it is an impressive feat with data all moved about and modified, but still.. something about it just feels wrong. Personal opinion. Because one person is taking something someone else created. Yes, we edit the ROMs, but we create our own code for it, and if someone just decides to take it, then yes I would say that is rude. then again it'll just be uncompressed in savestate, so what's the damn point. Anyways "Toughest buzz bomber ever"? Also this little attack change that will eventually become an Amy+hammer hack. If anyone's interested, I just posted my Buzz Bomber port on Sofia. Look at it, it might help you. Well folks, I got bored earlier today, and decided I'd make a boss. But I wasn't the only one who was bored, and not the only one who decided to make a boss. Thus, a friendly competition was created. Due to various reasons, two of the competitors pulled out, leaving myself, snkenjoi and qiuu in the running. So, we set up some rules and got underway. - Only preliminary work allowed was to set up PLC's, Art and a skeletal code (as it were) for the boss. - Time limit was one hour, after the time was up, a few judges were rounded up. Level, art and basic setup was done in advance, physics were coded within one hour. Unrelated to this, snkenjoi persuaded me (and contributed to make it work on Fusion) to release the MD port of MMZ3 good future. Don't worry, I won't be making a habit of it. I did it simply to test the concept and for my own personal enjoyment. They wouldn't've been released publically if not for this thread. FEAR THE MIGHTY ASCII EMPEROR!